The 27-inch IPS-Glass Panel Pro LED Monitor isn't the first Monoprice IPS monitor that I've looked at, but it's the first that doesn't feel like a compromise between price and features. The screen itself has never been the issue. Monoprice uses high quality IPS panels from LG along with efficient LED backlights. The first display I looked at, Monoprice's 27-inch IPS LED CrystalPro Monitor, had a wobbly stand, inexpensive-looking case design, and two of the seven menu buttons on the display didn't do anything. The second Monoprice display, the 27-inch IPS Zero-G Slim, had a better stand, but the buttons were on the back of the display with no labels on the front. Using the menus required me to crane my head around the back to locate the proper button then come back to the front to see the onscreen menus and then back to the rear to find the up or down button. More concerning, the Zero-G Slim only offered dual-link DVI and VGA connections. The 27-inch IPS-Glass Panel Pro LED Monitor, however, has clearly marked buttons (that all work!) conveniently located on the bottom edge of the case. The Pro LED monitor's stand lets you easily swivel the screen left to right and allows for a few degrees of tilt, but it does not offer height adjustment and the ability to pivot into portrait mode. The display provides DisplayPort and HDMI connections in addition to dual-link DVI and VGA connections. While some newer monitors are beginning to support DisplayPort 1.2's daisy-chaining capabilities, the Monoprice does not. The Pro LED Monitor includes decent sounding speakers, though a pair of inexpensive desktop speakers would probably sound better. 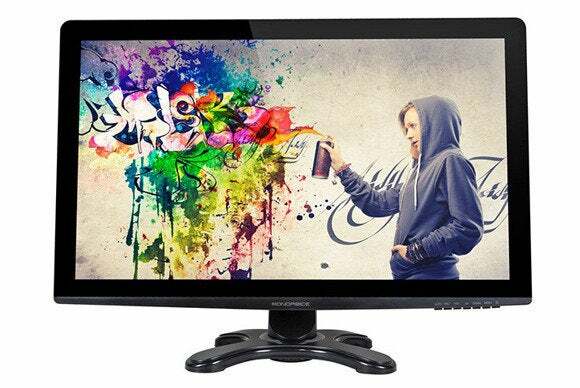 The Pro LED Monitor has the same 2560 by 1440 pixel resolution as the Apple 27-inch Thunderbolt Display. It features a glossy screen, like the Thunderbolt Display, but with less reflection—more in-line with the new iMac's glossy screen. The Monoprice's IPS display ensures wide viewing angles with no harsh color shifts as you move from left to right, or up and down from the center of the screen. I looked at a series of test screens and found no problems with light leakage and no stuck or dead pixels. Side by side with the Apple Thunderbolt Display, the Pro LED Monitor image quality was a bit warmer. Unlike the Apple display, the Pro LED Monitor offers color controls to allow for calibrating the display to your liking. Grays appeared neutral, though blacks were not quite as deep as on the Apple display. There is a high contrast mode available on the Pro LED Monitor, but I much preferred the images the monitor displayed with this feature off. Photographic images looked very good on the screen with natural looking skin tones and I found no uniformity issues. The 27-inch IPS Glass Panel Pro LED monitor offers similar onscreen performance to the much more expensive Apple's Thunderbolt Display. It lacks the fit, finish, and Thunderbolt port of Apple's offering, but if you care more about the images displayed than the case in the display is housed, the Monoprice display is great bargain with enough nice-to-have features to avoid feeling like a compromise.